Thynne + Macartney an independent, commercially focused, Queensland-based law firm is accelerating its growth with the appointment of two senior practitioners. Peter Mills, who joined the firm in March 2018, is a recognised expert on the Personal Property Securities (PPS) Act and how it operates with other laws, both in Australia and overseas. He has been recruited in the position of Special Counsel. Peter provides advice on compliance and enforcement under the PPS, and advises creditors and liquidators of insolvent companies. Michael Mayes was appointed in May 2018 as Senior Associate in the Banking & Project Finance group. He has experience advising banks, financial institutions and private lenders in a range of transactional banking and finance matters. Michael has particular expertise in construction and development finance, and has acted on behalf of receivers, mortgagees and other secured creditors enforcing and realising secured property. Peter Jolly, Chairman of Partners said the addition of senior and well respected practitioners, such as Peter and Michael, simply propels the growth strategy the firm is executing. “We are delighted to welcome Peter and Michael as it reinforces the specific growth strategy the firm has been pursuing for the past three years. The firm’s management has been making acquisitions of carefully chosen, talented individuals and we have seen the pay-off in the past two financial years. We are in a good, steady growth position,” Mr Jolly said.  Thynne + Macartney, is celebrating 125 years practising in Queensland this year. It is a unique milestone for Brisbane’s oldest law firm that is still trading under its original name. This firm’s expertise has been accumulated across generations of Queensland lawyers.